It seems like a very long time since we have seen a really good Phillies game. 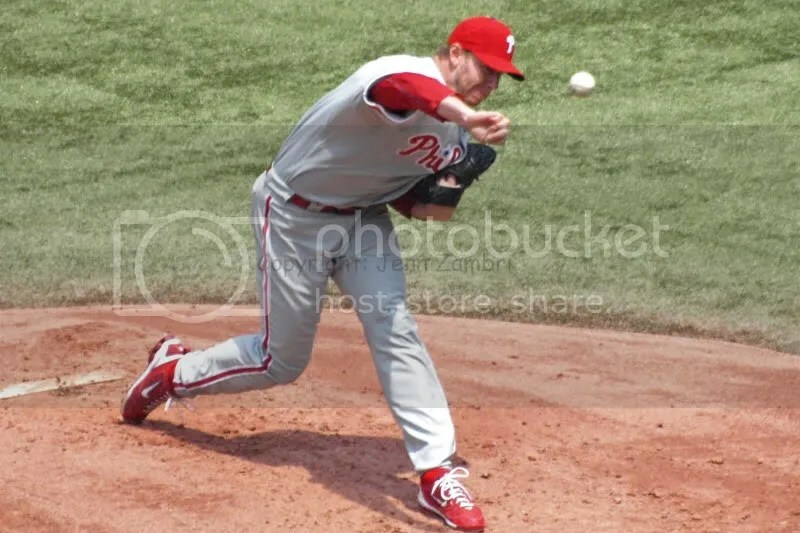 But with Roy Halladay on the mound last night looking like the ace that he is, it felt like old times again. After a year of struggles and injury, Halladay appears to be at 100% finally. Against the World Champion Cardinals Friday night, he pitched 8 innings and allowed only 2 hits, one of which was a solo homer. That would be the only run of the night for the Cards. The Phillies are in the process of finding out exactly what they have for next year. Halladay’s performance was a huge boost in that regard. They also tooled around in the outfield, moving guys here and there like a roulette wheel to see which one might hit the jackpot. As a result, Nate Schierholtz played center field for the first time in his MLB career. 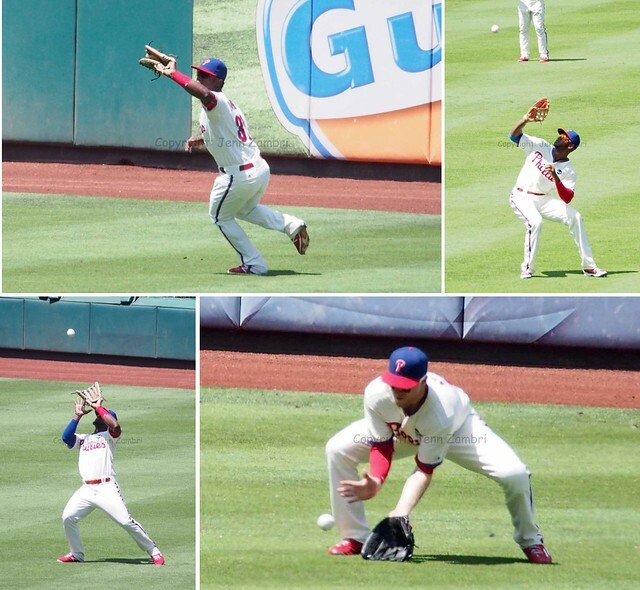 Domonic Brown started in right and then both guys got shuffled around later in the game. Even with all the changes, everyone held their own pretty well. 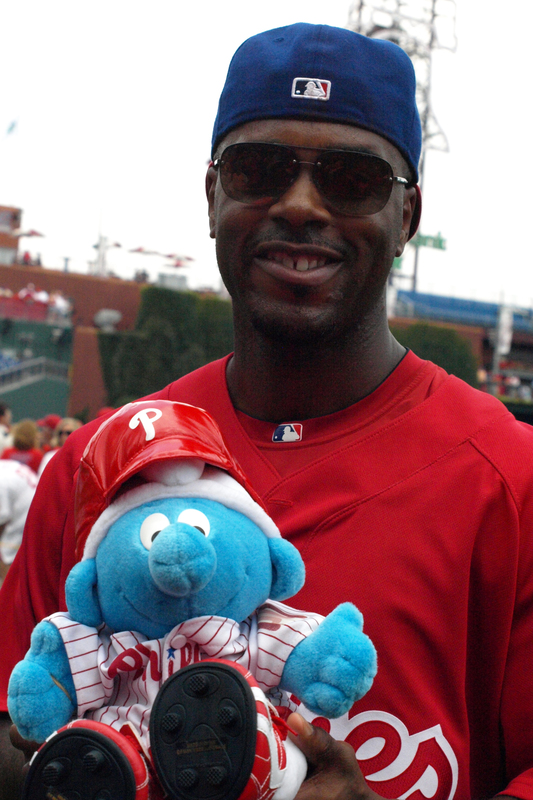 Brown knocked in the first run for the Phillies with a single in the second that scored Ryan Howard. The other 2 runs scored on an 8th inning 2-run homer from Chase Utley. He hit the ball so hard it went into the upper deck of the bullpen in center field. It looks like Utley has also found his groove again. The pitching was excellent for both teams, but the Utley homer won the game for the Phillies who walked away with a 3-1 victory. Game 2 starts tonight at 7:05pm. Cliff Lee will pitch and try to keep pace with the Doc’s amazing performance. And a quick congratulations to former catcher Mike Lieberthal who was inducted into the Phillies Wall of Fame last night! Lieby looked both humbled and honored as he accepted the award and thanked the fans for their support. Congrats to him…a well deserved honor! 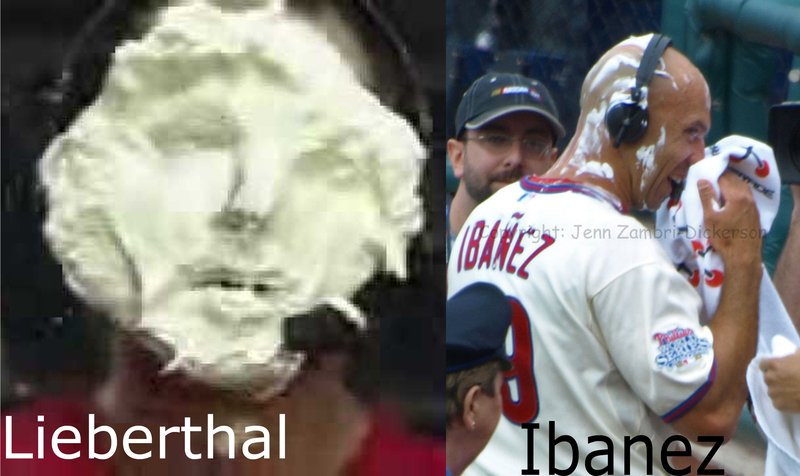 Usually when a player gets a game winning, walk-off hit, they can expect to get pied. However, sometimes this prank is also carried out following any outstanding performance. For instance, on June 2, 2002, pitcher Robert Person hit two home runs in a game against the Expos, the first of which was a Grand Slam. The result? 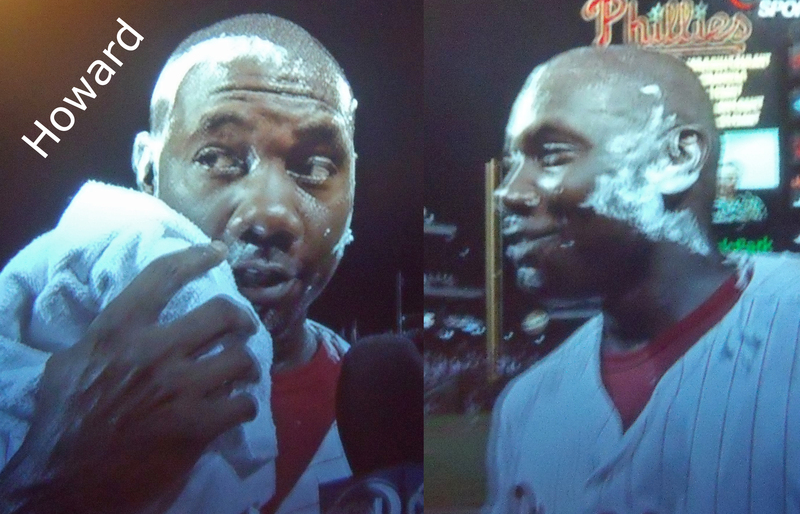 7 RBI for Person, a win for the Phils and yes, a pie to the face. In the 1990’s, the pie incidents were sort of random. 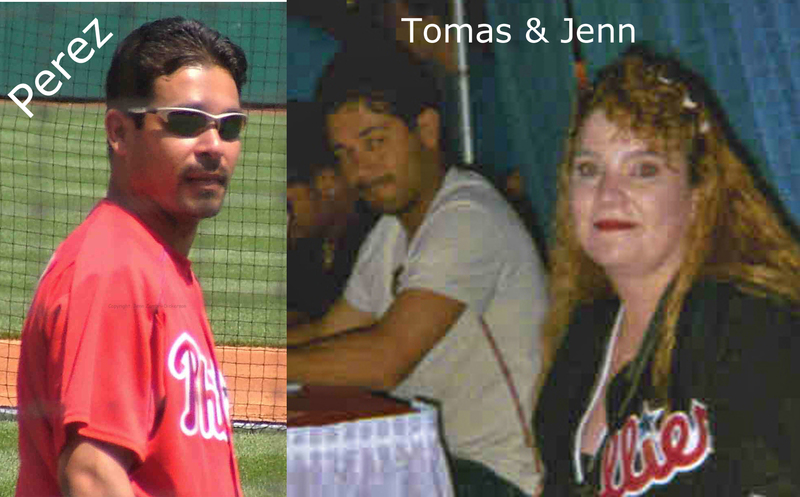 But when Tomas Perez joined the Phillies in 2000, he became the “official” Pie Guy and for the next 6 years, he did not miss a beat. Perez pied everyone. 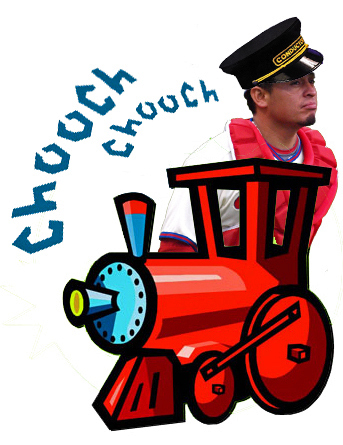 And his teammates loved him; Perez was riot in the clubhouse, keeping things loose and fun. And for me personally, Perez was the nicest, most approachable player I had ever met. I always stood in the same place before games and Perez took notice. All I had to do was wave at him, and he would run right over. We spoke before many games and I got countless autographs from him. There are some varying opinions on the pie pranks. Some players think it is funny; some are not so thrilled about it. As for the fans, I have heard everything from how funny it is to how stupid it is. One fan told me it is annoying because it ruins the post-game interview. Others wonder if it could be dangerous. And yet others look forward to it and find it entertaining. What do you think? Feel free to comment below. What I can tell you is this; the Pie Guy is a Phillies tradition that does not appear to be going away any time soon. Shakespeare once posed the question, “What’s in a name?” In baseball, a player’s nickname can stick like glue, whether they like it or not. 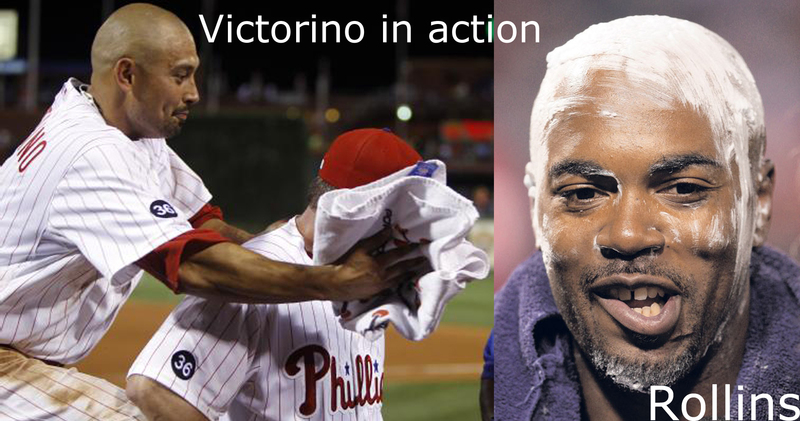 Here is a rundown of some of the Phillies player’s nicknames, past and present. It was a real Friday the 13th today for pitcher Blaine Neal, who likely pitched his way into the minors forever, losing the Phillies’ 2 run lead in the 9th against the Pirates. The Phillies lost 6-5 and Neal, who has not seen action in the majors since 2005, likely will not again. But really, that is the least of the worries for the Phils. For the second day in a row, the Phillies could not muster any offense until the 6th inning, when it exploded into a 5 run gain. 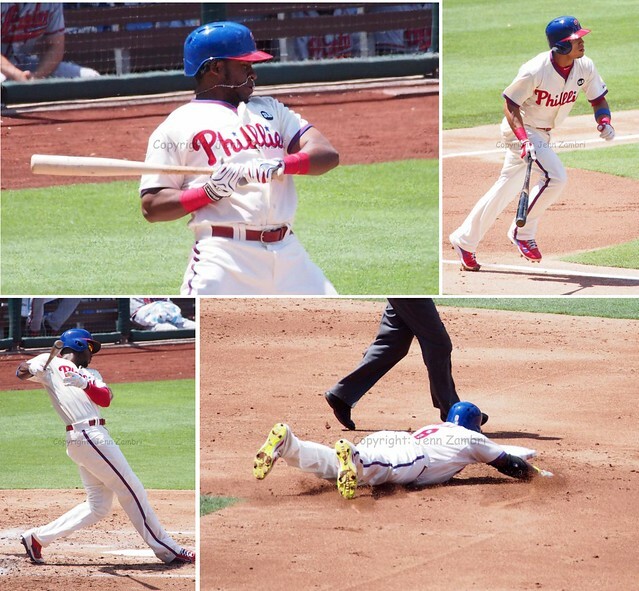 Prior to that, it was nappy-nap time for the Phils. Jason Donald and Ryan Howard led the mini-stampede; Donald went 2 for 5 in the game and Howard whacked a 2 run homer in the 6th. For the most part though, the offense has been quiet; they are obviously saving it up for April. Chris Coste, however, needs to get the monkey off his back and soon; Coste has not gotten a hit yet in grapefruit league action. Great news at 3rd base! Pedro Feliz is back in action and said he is ready to go. So, Opening Day? No problem! And no Friday the 13th woes here either. As for Chase Utley, he began sliding drills today and so far, so good. He hopes to get in a live game next week sometime. 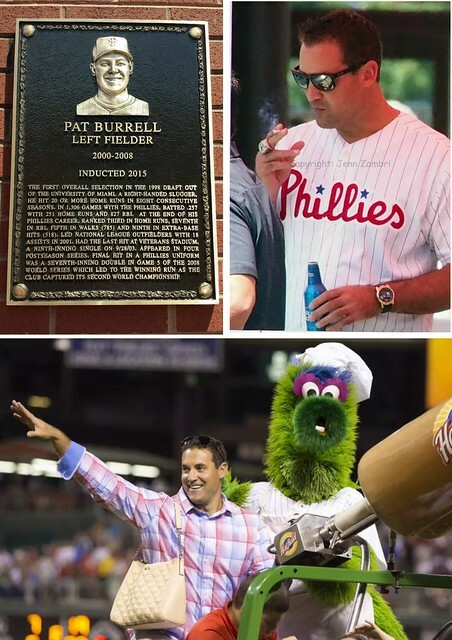 And in former-Phillie Pat Burrell news, Burrell took out a full-page ad in both The Philadelphia Inquirer and the Daily News today to thank the Philadelphia organization and the fans for his 9-year run. And if you did not love Pat before, you have got to admire him now. 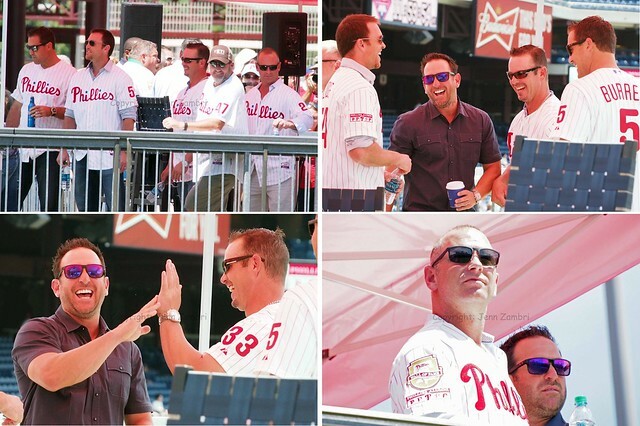 A very classy move; hopefully, once he decides to retire, he will return to Philadelphia and go out as a Phillie, like Mike Lieberthal did last year. The ad is in the photo to the right; click on it to enlarge and read the whole thing. Best of luck, Pat! 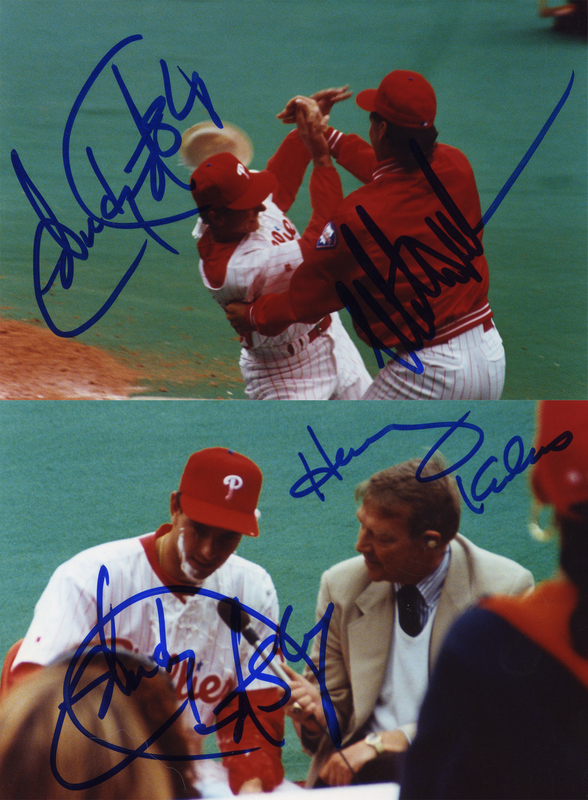 *Read more about the Phillies at MY OTHER HOME PAGE! 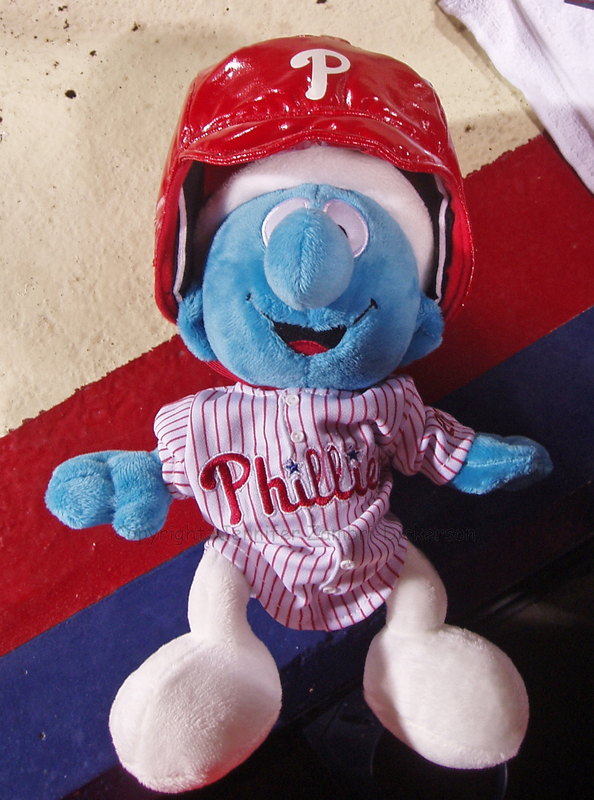 Phillies Phollowers has joined forces with Phightin’ Phils Phorum! Please check out our site and bookmark it. *Remember also to check out our homepage My Team Rivals and our Phillies, Flyers, Eagles, Billy Penn Curse, Reinstate Pete Rose, Phillies Mets Rivalry, Phillies Marlins Rivalry, and Phillies Braves Rivalry and my very own Miami Dolphins page, The Dolphin Pod! It has always been a tradition in baseball to assign players a nickname. Whether that be a descriptive one, a play on words, or just plain weird, most guys seem to get one at some point that winds up sticking with them. I have compiled a list of nicknames for the 2008 Phillies that I could find and then other Phillies from years past. I tried to avoid any media-given names and just stick to the stuff the players use amongst themselves. I also put years by some of the older or more obscure player names. Hope you enjoy it…have a Happy Holiday!!! From September 9, 2005: Where’s the ball? Where’s my glove? Where’s my helmet? Ugh! ….By the way, look to the far right…you will see the ball.